Every day little Timmy and Bobby would walk to school, carrying a shotgun, a Bowie knife, maybe even a seven-shot hunting rifle, enabling them to slaughter their fellow students, should they feel so inclined. 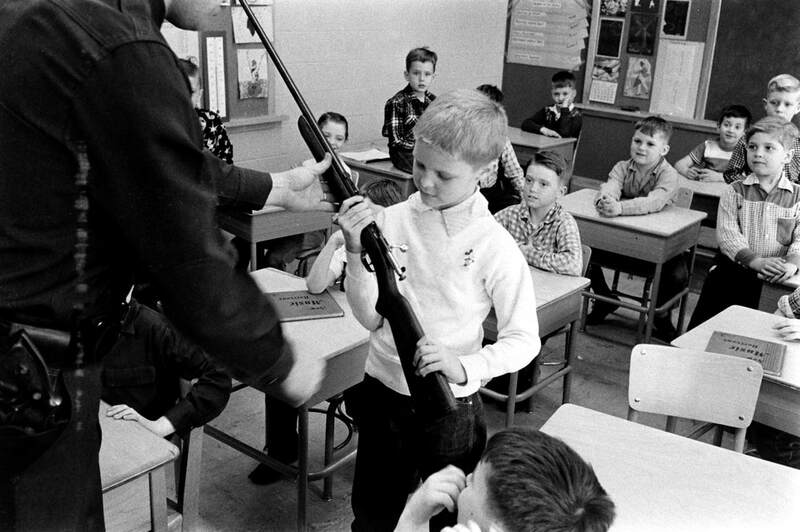 The carrying of weapons, by school kids, was not only legal, it wasn’t unusual. That was America, 70-some-years ago. Other students packed heat, as well. It wasn’t a requirement, you could lock, load and carry, without your teacher being reduced to hysteria, in the America of yesteryear. Without the government coming down on you like a heat-seeking missile, as it sought to protect you, from yourself. A-R-15? And, if so, does this imply that if they’d only had more bullets and a faster pull-action, they would’ve unleashed hell on one another. Because they were unable to resist that shiny black grip, with its military-style look? Apparently. Back in the day, almost every family had a mom and a dad. Life could be hard, far harder than today, but no one saw this as an excuse to buy a weapon and kill as many people as possible. Most such stories, about gun-toting adolescents, took place in rural America. Not in large urban cities, where people were packed together like sardines, and tensions rose, the result of too many people, and too few jobs leading to overcrowding and near unlivable slums, with dad working in the slaughterhouse or the steel mill, 12 hours a day, 7 days a week. There were plenty of Blacks folks living there, as well, as they made their way from the South to the North, in an effort to escape Jim Crow. Almost no one had it good, in any modern sense, even if some had it worse than others. Degrees of suffering were incremental, with differences between poor Blacks and Whites, in most cases, being marginal. Seventy-years-ago, my grandmother would rise at 3:30 in the morning, make a cup of coffee, set her long hair in a bun, and begin to roll biscuit dough for my Grandfather’s breakfast. If my Grandfather had male privilege or White privilege, he didn’t know it. He’d rise at 5:00 AM, eat a big breakfast of eggs, grits, biscuits, and salt-pork, which was the poor-man’s bacon, mostly fat, and preserved by heavy salt content, and then head out at the crack of dawn just as the sun began to rise, where he worked brutally hard in the fields as a dirt-poor sharecropper. Six hours later, he’d come in for lunch, which my grandmother began preparing as soon as breakfast ended. After eating another large meal, he’d head back out, till the sun began to set. Twelve hours of back-breaking work, in the blistering Mississippi sun, that was his White, male-privileged. My father’s father was, likewise, a poor, nominally educated “Hunky,” who escaped from Czechoslovakia or Hungary and came to America in the early part of the 20th century. He worked tending a steel-smelting blast furnace, 12 hours a day, 7 days a week, physically laboring under conditions that make the 3rd world of today, seem inviting, by comparison. It was, however, better than the hellholes of Eastern Europe that he and other migrants came from. In those days there was no welfare. No food stamps. No free healthcare. No section 8 housing. No social security. Just Christian charity. And the people thrived, in spite of their hardship. Freedom was not free, it never is, but it was a good deal better than the totalitarianism of European Monarchies or Marxist dictatorships—to say nothing of the tribalism that fractured the rest of the world. They understood this without hesitation, even as their great grandchildren have become willfully, blissfully, ignorant as dirt about such matters. A doctors visit to your home, when I was a boy, might cost a few bucks, paid on the installment plan. A doctor in a big city hospital might make two dollars an hour. For the better part of the first hundred and fifty years of “The American experiment,” inflation—that demon devourer of the working man's wage—was kept in check, and the wealth of the nation increased, especially among the poor. Meanwhile, my grandmothers—on both sides of the family—spent their time cleaning clothes with scrub-boards, using harsh lye soap. They cooked everything from scratch. Not because they were dedicated to eating naturally. They were just dedicated to eating. Something. Anything, that could be grown or bought for a few dollars, a few pennies. At the height of the great depression, when my father was a boy, his younger brother fell in a boiling tub of lye soap and burned to death. My grandmother took his body and ran miles through the snow for help. She never really recovered, mentally or emotionally, but she still took care of her six other children. That was her White privilege. Almost no one had fancy dresses or suits, except that one, that hung in the closet, to be pulled out for special occasions. No one had TV’s, video games, or air-conditioning, many didn’t even have indoor plumbing. It was a much, much harsher world than today. Even so, kids killing kids, in large numbers, was rare. There were mass shootings. In fact, more than we see today, but they were generally the product of organized crime. Today, it’s little different, with one exception, that being children killing children.